I’ve recently discovered the magic of Vermont Salumi’s chorizo, it’s got such great flavor that you really don’t need to add much else to create some very tasty offerings. For this clam and chorizo pasta begin by sautéing some chopped shallot and garlic in a little bit of oil. Then take your chorizo and slice them top to bottom to peel off the casing, add to your shallots and garlic and lightly break apart with the side of a spoon. While that’s cooking bring a half inch of clam stock to a boil in a separate pot, add you clams, cover, lower heat to medium, and cook until your clams open, approximately five minutes. Spoon the chorizo mixture into the clam pot, stir, let sit for a minute, and serve over pasta or alone with a sliced baguette. 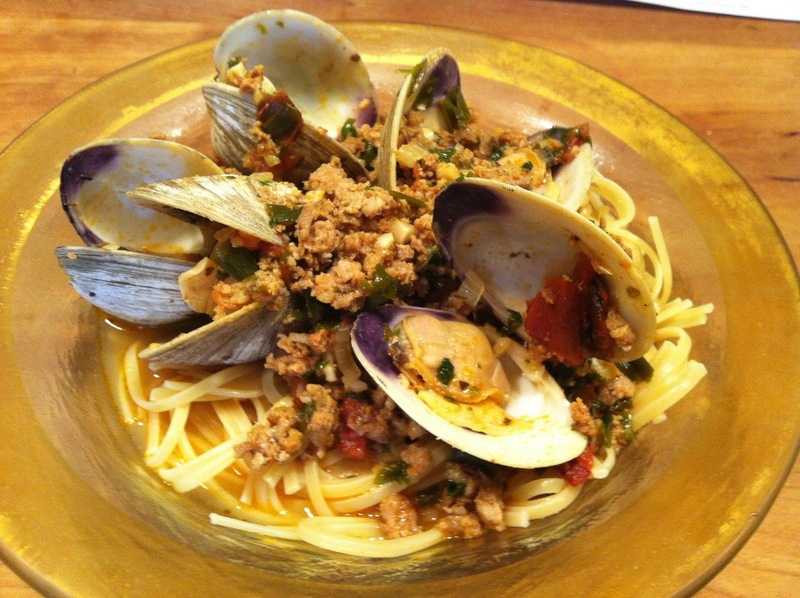 I used clams this time around but it would have been equally amazing with mussels. Garnish either with some chopped chives, the green tips of some scallions, or parsley.